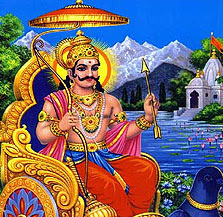 Shani is the symbol of finance, religion, karma and justice. Shani gives wealth, property and absolution. Shani is very painful for sinner. Shani does welfare for those people who cut their nails in frequent interval. People donate black gram, black sesame, urad or black clothes to poor in Posh month. People who donate black umbrella to protect from Sun in Jayeshtha month. Shani keeps his shadow on them. Shani give liberation from pain to those people who feed and serve dogs. Shani remains happy with those who help blind people. Shani opens the door for their progress. People who keep fast on Saturday and donate food to poor. Shani gives immense food to them. Shani remain happy with those who don’t eat fish and feed fish. Shani remains happy with those who takes bath everyday and remain clean. Shani remain happy with those who give respect to cleaners and helps them financially. Shani gives them money. Shani remain happy with those who don’t take rights of hard working person. Shani remains happy with those who give respect to poor women. Shani always help them. Shani always take care of those who worship Shivaling. Shani helps to those who doe Shradh and feed food to crows. Shani remains happy with those who help unaided old. Shani gives immense food to them. Shani becomes protector to those who worship lord Hanuman. Shani does welfare for those who help handicapped. Shani remains happy with those who don’t drink alcohol. Shani helps with their family, if they adopt veg food. Shani does welfare to those who wear seven faces Rudraksha. Shani always help to those who don’t take interest from others. Shani helps to those who help leprosy people. Shani becomes angry when people speak lie without reason. Shani becomes angry when people don’t give respect to old and parents. Shani becomes indisposed when someone take right of weak or women. Shani becomes weak when someone does careless. Shani becomes angry when one doesn’t wake up before sunrise and sleep during sunrise. Shani becomes angry when person cut the green trees. Anyone can do Shani’s psalm. Chant this psalm facing east-west side. Chant psalm in night or midnight. Chant psalm with Rudraksha or Rakatchadan garland. Remember your idol, lord Shiva or Shri Krishna before chanting psalm. Householder avoids wearing black clothes while chanting psalm. “Om Sham Shaneswaraye Namah” is the vaidik psalm. Shani never become angry with this psalm and never get bad eye.